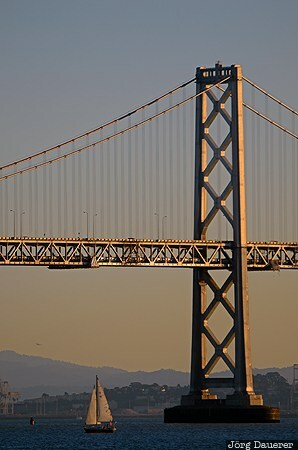 A tower of the San Francisco - Oakland Bay Bridge (also called Bay Bridge) connecting San Francisco and Oakland and a lone back-lit sailing boat illuminated by warm evening light seen from Treasure Island. The Bay Bridge is in California at the Pacific coast of the United States. This photo was taken in the evening of a sunny day in November of 2012. This photo was taken with a digital camera.